Yep, you can still find white-water rapids like this on California's Tuolumne—even with the drought. 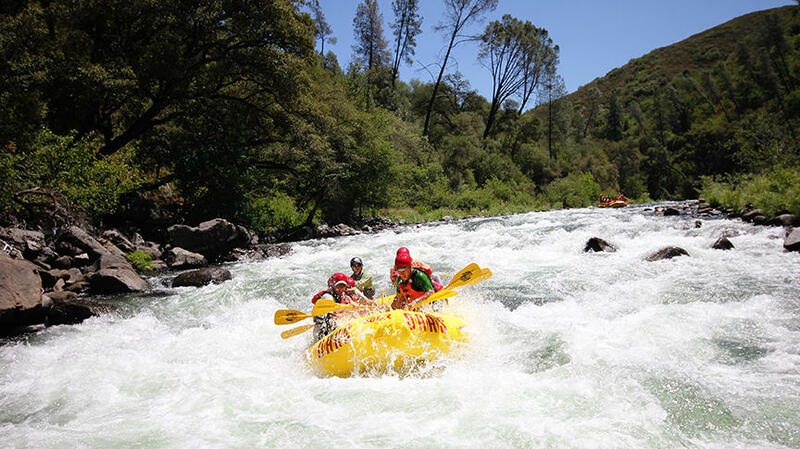 Yep, you can still find white-water rapids like this on California’s Tuolumne—even with the drought. But if you love the outdoors, like I do, it’s impossible to ignore the effects it’s having on your fun. California just had one of the its worst ski seasons in decades. Q: So, any chance of getting out on a river trip in California this summer?Markle: Yes! Even though we’re coming off the driest winter on record here in California, multiple high-elevation reservoirs will help ensure raftable flows on the South Fork of the American, near Sacramento, from Memorial Day through Labor Day. If you want something a little more exciting, you can find Class IVs on the Middle Fork of the American River, where we’re expecting guaranteed flows for boating on Saturdays & Sundays all summer long. We feel very fortunate. Q: Any other rafting options in California?Markle: On the Tuolumne River near Yosemite—which I consider California’s premier river trip—the San Francisco PUC will be releasing good flows from Hetch Hetchy in April and May and more moderate, but still fun flows from June through September. This will be a great year to experience “the T” without the epic high water we can see in a big snow year. The Tuolumne River is just three hours from the Bay Area, but it has the feeling of a remote wilderness river trip. Only two outfitted rafting trips are permitted to launch per day, and the river offers 18 miles of Class III-IV whitewater interspersed with sandy beaches for camping and side canyons and historic gold rush era sites for exploring. It’s the perfect two- or three-day getaway in the Sierra, and it fits well with a visit to Yosemite National Park. Q: Now, where would you recommend people go if they’re traveling with kids?Markle: We offer family-friendly rafting trips for kids as young as 4 years old on the Klamath River, near the Oregon border. I’m actually taking my 4-year-old son on his first multi-day rafting trip on the Lower Klamath over 4th of July this year! Q: How about SoCal? Are you able to do any trips down there?Markle: Unfortunately, based on the dismal snowpack in the Southern Sierra, outfitters on the Kings, Kaweah, and Kern Rivers down south are bracing for virtually no rafting season this year. At all. Q: Any other thoughts?Markle: In a year like this, river trips certainly feel like a luxury, but as long as water managers continue to send water downstream for power generation, agriculture, and for thirsty communities, we will continue to offer people a break from their over-connected, busy lives—and an escape from the summer heat, as long as you don’t mind a cold splash of water in your face every now and then.